Railroad bridge spanning Cumberland River at Nashville. (About) Nashville, Tenn. Fortified railroad bridge across Cumberland River. Barnard, George N., 1819-1902, photographer. Summary: Photograph of the War in the West. This photo is of Hood before Nashville. Continuing his policy of the offensive at any cost, Gen. John B. Hood brought his reduced army before the defenses of Nashville, where it was overthrown by Gen. George H. Thomas on December 15-16, in the most complete victory of the war. The photo was taken during the battle. Published 1864. Reproduction Number: LC-DIG-cwpb-02092 (digital file from original neg. of left half) LC-DIG-cwpb-02093 (digital file from original neg. of right half) LC-B8171-2642 (b&w film neg.). Repository: Library of Congress Prints and Photographs Division Washington, D.C. 20540 USA. LOC. 11/8/1861 East Tennessee Unionist Bridge Burnings The Hiwasee, Strawberry Plains, Watauga, and two bridges over the Chickamauga were hit. 2/6/1862 Destruction of railroad tracks by men from the USN "Tyler"
7/25/1862 Attack on Grand Junction Wheeler attacked and destroyed the railroad at Grand Junction. 9/5/1862 Skirmish near Humboldt at Burnt Bridge Rebels attacked Burnt Bridge setting it on fire. They are later repulsed and the bridge is saved. 10/5/1862 Skirmish at Chewalla Small skirmish took place at the water-tank. 10/7/1862 Skirmish at LaVergne Negley repulsed Forrest in this contest, capturing and destroying 3 railroad cars. 10/23/1862 Skirmish at Shelby Depot Rebels set fire to bridge. Upon dispersement of the rebels, the federals put out the fire. 10/31/1862 Skirmish at "Dead Horse Trestle" Morgan engaged the federals, routing them, then burned trestles to prevent RR use by feds. 12/30/1862 Destruction of the Holston and Watauga railroad bridges Carter made a raid into East TN and destroyed the Watauga and Holston Bridges as he went. 3/21/1863 Attack on a railroad train, Grand Junction Confederate guerillas derailed a construction train and unsuccessfully tried to capture a pay train. 3/25/1863 Attack on Brentwood Forrest attacked Brentwood burning the bridge and capturing the command stationed there. 3/29/1863 Affair at Moscow Guerillas attacked a passenger train, robbing the passengers and capturing the soldiers on board. 4/9/1863 Affair near Nashville Wheeler attacked a train northeast of Nashville. Unable to cross the river, he shot cannon at it. 4/10/1863 Affair at Antioch Station Rebel cavalry attacked a train near La Vergne, routed the guard, and set fire to seven cars. 4/10/1863 Skirmish at La Vergne A guerilla force attacked a train near La Vergne, the cars were destroyed. 6/20/1863 Destruction of bridges near Strawberry Plains Col. Sanders destroyed the small bridges between Knoxville and Strawberry Plains during his raid. 6/21/1863 Destruction of railroad around Mossy Creek Bridge While moving through the Mossy Creek region, Col. Sanders had the railroad destroyed if convenient. 6/29/1863 Destruction of Tracy City Railroad track After moving into the area, Col. Wilder destroyed the Tracy City RR. 7/18/1863 Track damaged near Germantown Rebels tore up track two miles from Germantown. 7/30/1863 Burning of trestle near Middleton Col. Richardson had his men burn a trestle and tear down telegraph wire as a memento of passing by. 8/21/1863 Burning of Nickajack Bridge Union troops fired the Nickajack Bridge in order to break reb communications along N & C RR. 9/2/1863 Capture of Knoxville When Burnside captured Knoxville, his troops came into possession of 2 locomotives and several cars. 10/5/1863 Wheeler attacks Murfreesboro After moving to Murfreesboro, Wheeler captures a bridge across Stones River and destroys it. 10/5/1863 Affair at Christiana Colonel Harrison moved his troops into Christiana, capturing the town and destroying RR material. 10/15/1863 Occupation of Zollicoffer Upon occupying Zollicoffer, Union cavalry proceeded to destroy much of the RR surrounding the city. 10/26/1863 Guerilla Attack on train at Gallatin Tunnel Guerillas placed a torpedo on the track just south of Gallatin Tunnel, which later wrecked a train. 10/28/1863 Burning of bridge at Wauhatchie As the rebels retreated from the advancing federals, they burned a railroad bridge. 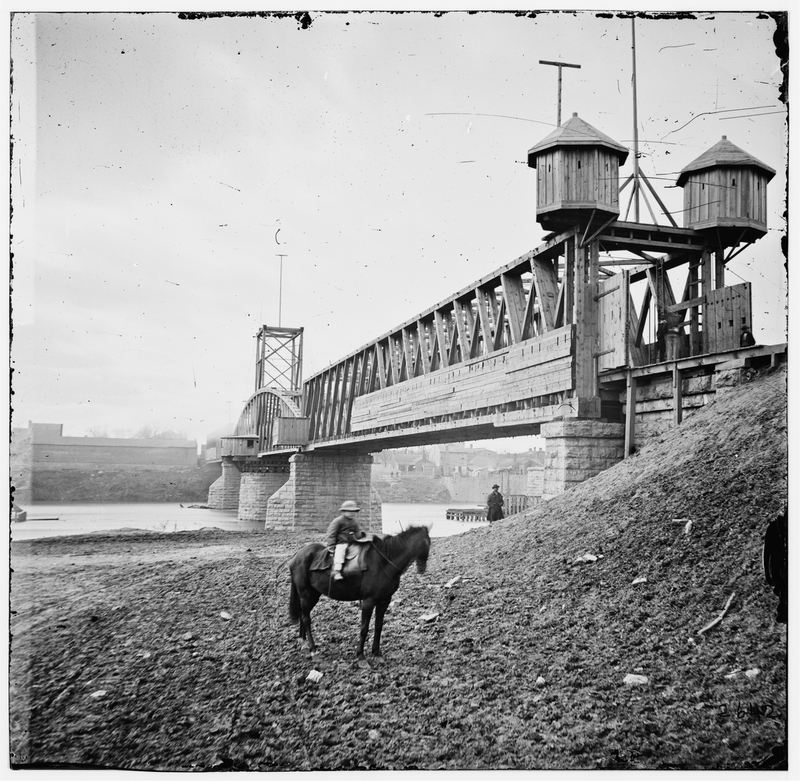 11/25/1863 Burning of Ooltewah Bridge Fourth Michigan Cavalry spent the morning of 11/25 destroying the Ooltewah Bridge. 11/26/1863 Burning of Chickamauga Station Upon retreating from Chickamauga Station in the face of Sherman's advance, rebs fired the depot. 11/29/1863 Destruction of bridges at Calhoun During his retreat, Col. Carter was ordered to destroy the bridges near Calhoun to stop fed advance. 12/2/1863 Track destruction at Saulsbury Lee descended upon Saulsbury, destroyed 2 miles of track and bent the rails. 12/4/1863 Trestle Work at La Fayette Forrest destroyed 100 yards of trestling on his move from La Fayette to Moscow. 12/25/1863 Burning of Train near La Vergne Rebels attacked and fired a train. Federals drove them off and saved all but one car. 3/16/1864 Raid on N & C RR, near Tullahoma Rebels forced train off track and fired it. Federals drove them off and saved all but 3 cars. 6/23/1864 Attack on train near La Fayette Guerillas fired on a train near La Fayette, killing and wounding several people. 8/15/1864 Raid on the N & NW RR Guerillas attacked the N & NW destroying 600 cords of wood and capturing some of the employees. 8/24/1864 Skirmish at Strawberry Plains Bridge (1864) On the night of 8/24, Wheeler's men tried to burn the bridge, but were foiled by the garrison there. 8/30/1864 Skirmish at Tracy City Wheeler attacked and drove in a small force at Tracy City, and destroyed a railroad bridge. 9/2/1864 Stopping of a train near Murfreesboro Rebels stop a train by piling wood on the tracks. Retreat when feds on train open fire. 9/4/1864 Action near Elk River Bridge Wheeler destroyed a portion of the track and telegraph line before retiring toward Sulfer Branch. 9/26/1864 Forrest's raid on Elkton Forrest found the Elkton block-house deserted and had it destroyed along with surrounding materials. 9/27/1864 Destruction of RR between Pulaski and Columbia Forrest moved toward Columbia and proceeded to destroy all railroad and track to Columbia. 9/28/1864 Destruction of RR near Tullahoma Forrest ordered the N & C above and below Tullahoma to be cut by Boone and Kelleher. 10/1/1864 Action near Columbia Forrest marched toward Columbia, burning all block-houses and bridges he came across. 10/10/1864 Affair at South Tunnel, Gallatin Confederates attacked the South Tunnel, driving away the guard, and tore up the track there. 10/16/1864 Skirmish at Mossy Creek Confederates attack bridge and route guard, but due to small force size was unable to fire bridge. 10/18/1864 Raid on the N & NW RR (1864) Guerillas attacked the N & NW, destroying the tracks, and burning a train and firing into others. 10/21/1864 Destruction of RR near Russellville Palmer moved toward Russellville, destroyed all track in the vicinity, and returned to Bull's Gap. 11/5/1864 Attack on Johnsonville Forrest attacked Johnsonville and burned many RR buildings there. 12/2/1864 Operations against stockades and block-houses on the N & C RR Rebels attacked block-houses and stockades up and down the N & C.
12/6/1864 Lyon's raid on RR near Clarksville Lyon made an attempt on Clarksville. Finding it well defended, he tore up track near it. 12/13/1864 Attack on railroad train near Murfreesboro Rebels set fire to track, stopping and firing on a train. Feds clear the track and save the train. 12/15/1864 Capture of railroad train near Murfreesboro Rebels cut the track near Murfreesboro, capture a train, and burn it after routing its guard. 2/16/1865 Attack on Railroad at Athens and Sweet Water Vaughn attacked the railroad at Athens and Sweet Water, capturing the garrison at both places. Recommended Reading: Stealing the General: The Great Locomotive Chase and the First Medal of Honor. Description: "The Great Locomotive Chase has been the stuff of legend and the darling of Hollywood. Now we have a solid history of the Andrews Raid. Russell S. Bonds’ stirring account makes clear why the raid failed and what happened to the raiders. "—James M. McPherson, author of Battle Cry of Freedom, winner of the Pulitzer Prize. On April 12, 1862 -- one year to the day after Confederate guns opened on Fort Sumter -- a tall, mysterious smuggler and self-appointed Union spy named James J. Andrews and nineteen infantry volunteers infiltrated north Georgia and stole a steam engine referred to as the General. Racing northward at speeds approaching sixty miles an hour, cutting telegraph lines and destroying track along the way, Andrews planned to open East Tennessee to the Union army, cutting off men and materiel from the Confederate forces in Virginia. If they succeeded, Andrews and his raiders could change the course of the war. But the General’s young conductor, William A. Fuller, chased the stolen train first on foot, then by handcar, and finally aboard another engine, the Texas. He pursued the General until, running out of wood and water, Andrews and his men abandoned the doomed locomotive, ending the adventure that would soon be famous as The Great Locomotive Chase, but not the ordeal of the soldiers involved. In the days that followed, the "engine thieves" were hunted down and captured. Eight were tried and executed as spies, including Andrews. Eight others made a daring escape to freedom, including two assisted by a network of slaves and Union sympathizers. For their actions, before a personal audience with President Abraham Lincoln, six of the raiders became the first men in American history to be awarded the Medal of Honor -- the nation's highest decoration for gallantry. Americans north and south, both at the time and ever since, have been astounded and fascinated by this daring raid. Until now, there has not been a complete history of the entire episode and the fates of all those involved. Based on eyewitness accounts, as well as correspondence, diaries, military records, newspaper reports, deposition testimony and other primary sources, Stealing the General: The Great Locomotive Chase and the First Medal of Honor by Russell S. Bonds is a blend of meticulous research and compelling narrative that is destined to become the definitive history of "the boldest adventure of the war." With maps of all the Confederate railroads and contemporary photographs and facsimiles of such documents as railroad tickets, timetables, and soldiers' passes, the book will captivate railroad enthusiasts as well as readers interested in the Civil War. Superb and scholarly effort from Mr. White is readable and laudable, and he offers to us enormous access to the best pictures.